iCarly: Groovy Foodie! 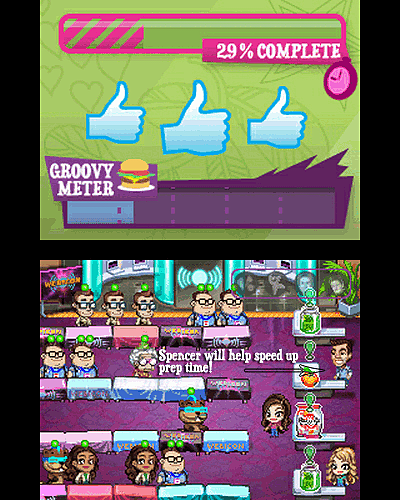 is the latest fun action-puzzle game based on iCarly, Nickelodeon’s popular live-action series for kids and teens, available exclusively for Nintendo DS. 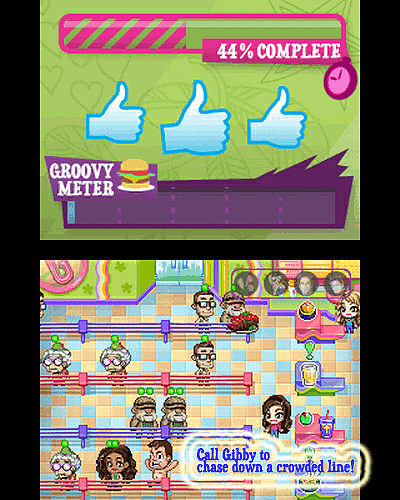 iCarly: Groovy Foodie! sees Carly and Sam get into all kinds of trouble at a local hot dog stand and have to complete community service and feed the citizens of Seattle – or face going to jail! Help the troublesome twosome out of trouble and serve wacky dishes to crazy customers in a fast-paced, action puzzle game that dishes out all the random hilarity from the show! •Prepare endless dishes and serve them to quirky customers before time runs out! 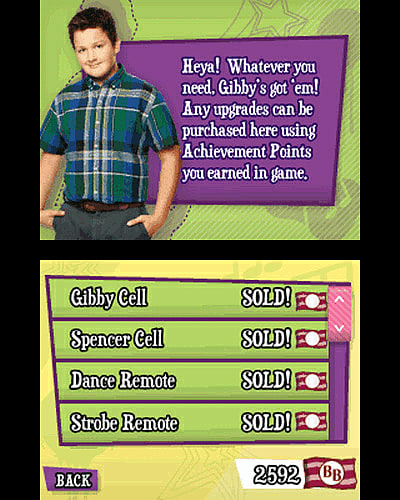 •Interact with the entire iCarly cast and earn special upgrades to have Sam trigger “Random Dancing”, see Gibby charge shirtless into lines of customers, and more! •“Battle” 20 types of crazy hungry customers, from web mascots in kooky costumes to scary prisoners from King County Prison, and even fellow students throwing goop at you! •Serve up over twenty fun and imaginative food creations including Spaghetti Tacos, Doughnuts on a Stick and Fudge Balls! 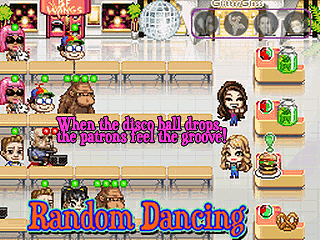 •Match wits with characters like arch nemesis Nevel Papperman, mean teacher Ms. Francine Briggs, Lewbert the nasty doorman and T-Bo. •There are five fun locations from the iCarly show , including the popular Groovy Smoothie, Webicon, Ridgeway High School, King County Prison and Crown Ridge Mall! •Explore a seemingly endless variety of dishes to serve in Spencer’s customisable food prep guide and create your menu at the start of each location! •Utilise Freddie’s customer database to understand the unique preferences of each customer and concoct the perfect strategy to feed the crowd!